One quick session will have your skin looking beautiful and bronzed! Green is the new Tan! We only believe in a Natural spray tanning solution! We believe in offering the most radiant and natural tan possible. Having a package with Luxury Mobile Spray Tan Scottsdale provides you numerous benefits, including discount spray tanning with the Best solution out there. Call, text or schedule on-line to book your spray tanning session and get your spray tanning package today to save you money. Discover the ultimate in-home pampering experience: Luxury Spray Tanning Parties! Get your friends together and prepare for a night you’ll never forget. You choose the level of pampering, from a simple custom spray tanning party, to a full-on in-home salon/spa experience. Our Fast-Acting Luxury EXPRESS spray tanning solution allows you to rinse off as soon as 1 to 3 hours later after your spray tan session. 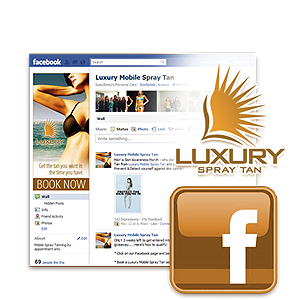 As with all of our spray tan solutions, Luxury EXPRESS will give you a Rich, Healthy-looking tan that develops naturally. Luxury Spray Tan Scottsdale focus on perfection. We at Luxury Spray Tan are Master Certified Sunless Experts and have undergone extensive sunless training. Our product is a beautifully scented almond and raspberry solution that naturally hydrates your skin and provides you with the perfect color without the smell normally associated with spray tanning or tanning beds! Our custom spray tan approach includes a consultation with you to determine the desired color of your airbrush tan and we take the time to make sure you receive the perfect custom spray tan. At Luxury Spray Tan Scottsdale we go out of our way to make sure you achieve the very best natural looking custom spray tan and airbrush tan every time.